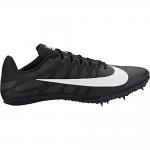 Updated to be even lighter with a snug fit and smooth transition, Unisex Nike Zoom Rival S 9 Track Spike is designed with the sprinter in mind for events ranging from 60m to 400m, including hurdle events and the long jump. Solid rubber through the heel has an updated horizontal traction pattern for optimal grip and durability. 8 removable spike pins made of stainless steel deliver optimal grip.